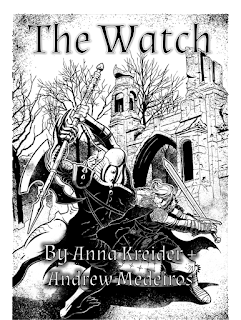 Today I have an interview with Anna Kreider and Andrew Medeiros on their new game, The Watch! It's now on Kickstarter and Anna and Andrew wanted to tell you all about it. Check out the interview below! Tell me a little about The Watch. What excites you about it? Anna: The Watch is a low-fantasy PBTA game about women and femmes/non-binary femmes who are fighting to retake their homeland from the Shadow – a darkly sorcerous threat that has the power to possess men and use them for its own violent ends. So much has already been lost to the Shadow – land, loved ones, and traditions. But their people have come together, forming a new fighting force from those able to resist the Shadow, which they call the Watch. As for what excites me about it, that's a tough call... Probably the thing I find most exciting, though, is the fact that The Watch creates stories that typically are reserved for male protagonists. When I was younger, the stories that I craved (and wasn't able to find) were stories about women who fight, so it's super great having created a game that tells the stories that I wanted to hear. And it's even better to see other people get just as excited about the chance to play out these stories! Andrew: I've always loved military dramas, I grew up with them and they really excite me. The chance to co-design a game like The Watch that aims to capture the feel and tone of those stories has been a real delight; and taking the 'band-of-brother' trope and inverting it to include people who are usually excluded from the genre makes me very very happy. What have you done with the PbtA system to fit the themes and play expectations of The Watch? Andrew: First off, we went with a 'less is more approach' for The Watch; streamlining the harm mechanics and simplifying weapons and gear, this let's us focus on who the characters are, not what they are. We've also added in new mechanics to reflect the hardships of war and the stressors therein: Jaded and Weariness. Jaded makes your characters better and more experienced soldiers but comes at the cost of burn-out down the road (not unlike Corruption from my earlier game: Urban Shadows), and Weariness is short term fatigue and stress that, if left unchecked, can lead to your character doing or saying something hurtful that they'll later regret. Basically, war is hard on people, and we have lots of ways to show that pressure. Have you done anything with character relationship mechanics, and if so, what have you done and how are you integrating it into the fiction and the rest of the mechanics? Andrew: Yep, we designed a new relationship mechanic called Camaraderie for the game. Camaraderie is earned as points with other characters (and NPCs). It isn't a representation of how good of friends you are, but simply how much potential you have to be so. When you're in need of help with a roll, you need to look to your comrades for aid, and the Camaraderie you have with others is what let's them help you out. In essence, the more good will you've stored up with others, the more potential there will be for them to help you in meaningful ways in the future. Many of the basic moves play with this new system of currency, allowing you to spend or earn it in unique ways. With a focus on telling stories about fighting divorced from a primarily masculine point of view, how do you frame violence in the game? Anna: As Drew mentioned, we streamlined the harm mechanics and simplified how dealing and taking harm works - and generally I find that the number of mechanics you have supporting a given outcome (like violence), the more players tend to engage with that outcome. But also, perhaps more importantly, with any PBTA game, the basic moves are what define what sort of actions the PCs will be taking, and thus what the major story beats in any campaign will be. And while we have a basic move to Prevent Bloodshed, we don't have a basic move to inflict violence, and that really informs how players approach the issue of violence in general. And something we do have are moves based around building and strengthening relationships with the people around you. Additionally, The Watch borrows from the structure of Night Witches, which has two distinct phases of play, each with its own moves and system. There are missions, in which characters engage in the military campaign against the Shadow's forces, and "normal" play, which is more normal PBTA-style play. So on your missions, you're going out and engaging in violence against Shadow forces, but when you come back to "normal" play, that's when you're falling back on the structure informed by the basic moves, which de-center violence in favor of other modes of interpersonal relations. So violence is still very much a part of the game. But it's framed very much as a necessary evil, in fighting for your existence against the Shadow, and when it's engaged in outside of a mission, there are mechanics that specifically call that out as toxic and socially maladaptive. What elements of The Watch do you hope will come out when people play it? Anna: Obviously, given the premise of the game, there's a level of gender commentary that is baked into the game, and I'm really happy about how excited some people have been to engage with that. But even if that's not your thing, it's really great seeing people telling stories with wonderfully diverse casts of women and nonbinary people about the struggle against injustice. And I hope that people will get as excited about the diversity of weird, wonderful, and diverse characters that get created as I do. Thanks so much to Anna and Andrew for the interview! Check out The Watch on Kickstarter now if it sounds your style!